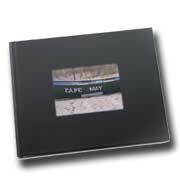 Custom coffee table photo books make for a warm, casual yet classy look in your home or office. To create these books, you can visit our store and work on our kiosk to design each page, selecting from various fun designs. Our staff will be there to assist you if you have any questions. No time to create your photo books? Our collage photo books are the perfect solution for you. Simply upload a selection of your photos and we will create a collage photo book for you in minutes (photos will appear in random order). These cute and totally fun flip books belong in every girl's handbag or guy's briefcase. On the road? Browse through photos of your fab friends, crazy kids, loving partner, parents or grandparents -- guaranteed to lift your spirits just when you need it! Proud parents and road warriors, you'll fall in love with these little books that give much more than you can imagine! 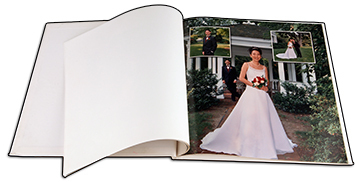 Looking for a high-end photo book with stiffened pages? A Professional flush mounted album is your answer. 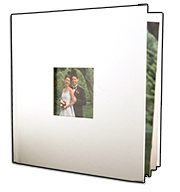 These are typically used as classic wedding albums and by those who prefer an elegant high-end coffee table photo book. To ensure your flush mounted albums are perfect, you will have final approval of every page design before they are printed. Note: In-store version has a window cover. Online version is a solid front cover.